I'm not crazy about living in Dallas, but ridiculous restaurants on every corner makes it a bit more bearable. Yes, they are all chains, but chain restaurants can deliver delicious food at cheap prices. I recently had an awe inspiring spinach salad at Maggianos. This is my attempt to recreate it (an easy version of course.) Spinach Salad with Peppercorn Pork Shopping List: Baby Spinach Peppercorn rubbed Pork Tenderloin (ask your butcher to add peppercorn rub, or buy this Hormel version) Red Bell Peppers Shallots Blue Cheese Crumbles Pine Nuts Balsamic Vinaigrette Time needed: 40 minutes Place pork tenderloin in baking pan and bake at 350 for about 35 minutes. While pork is baking, chop red bell pepper and shallots. Place both in shallow cooking tray and drizzle with olive oil and salt. When pork is cooked to desired tenderness, remove from the oven, cover with foil and let cool. Place red bell pepper and shallot mixture into oven and 'broil' for about 10 minutes. Place baby spinach on a plate. Add red pepper/shallot mixture Add blue cheese crumbles and pine nuts. Drizzle with favorite balsamic vinaigrette. 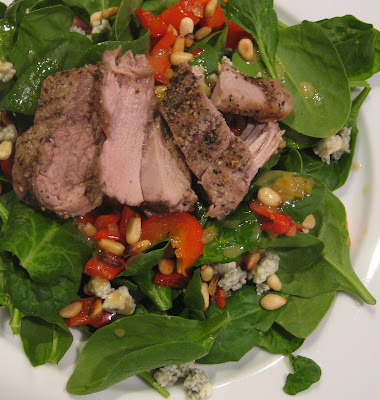 Slice pork in 1/4 inch slices and serve a few slices on top of each salad.